Not too long ago I proclaimed that Sam had gone a full year without a major medical event. When I made that hesitantly bold (not an oxymoron) statement I then asked that everyone knock on wood in an attempt to not anger the fates that clearly have it in for beagles. Well, it looks like some of you clearly skimmed that bit and shirked your wood knocking duties. Nosirree, you just couldn’t be bothered to tap on something wooden. I suppose I can’t prove you’re to blame, so I might let you slide. It could also be that I didn’t go big enough on my request. I asked that Sam have one year of being medical event free when I should have asked for something more like “one year and a day” or maybe “TWO years”. About a week ago, Sam had to be rushed to the vet. I’ll spare you the details. Suffice it to say it was kind of gross and she was in a great deal of pain. When she got home, she just collapsed on the floor exhausted from a really bad vet visit. I crossed my fingers and hoped that this would be Sam’s big thing for this year and the rest of the year would continue on quietly. So, if you wouldn’t mind, send some positive beagle energy Sam’s way. She could use it. I’ll do my part and ask that Sam be incredibly healthy for the next 5 years. 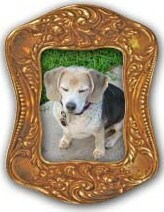 This entry was posted in Pets and tagged beagles, CCL, Sam, Sam Update.